Alexander Fokin quickReboot v1.2 S60v3 S60v5S^3 Anna Belle Unsigned Retailed by DSPDA™Often you need to reboot your smartphone. You can make this only by shutting it down and power on it after that. But it is not very handy. You have to press the “Power” button first time, and then wait until the screen will go out. Then you have to press the “Power” button one more time to turn your phone on. If you have the pin-code request for your SIM-card enabled you have to enter it. If you forget it the phone will be not able to receive calls. And persons who will call you will receive the “Busy” signal. 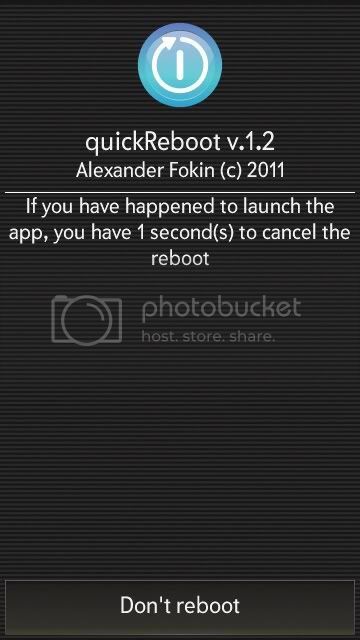 The quickReboot app makes the process of rebooting as simple as possible. Press the app icon and the phone reboots. This reboot is performed absolutely correctly (e.g. when it is performed when you change the display language) and doesn’t have any danger in it. If you had pressed the app icon accidentally you have 4 seconds to cancel the reboot by pressing the only button on the screen. Alexander Fokin quickReboot v1.2 S60v3 S60v5S^3 Anna Belle Unsigned Retailed by DSPDA™ URL http://symbian2share.blogspot.com/2011/09/often-you-need-to-reboot-your.html. NEXT.